In the initial stages of the adoption process the thought of having an open adoption with a birth mother evoked some concerns and fear in our mind. At the time, our perception was heavily influenced by the media, our lack of education and a few Lifetime movies. But now having some personal experience in this relationship and as an adoption consultant who walks with families through the process, I understand the benefits of an open adoption to all three parties of the adoption triad. Recently, I wrote a post debunking 5 myths commonly associated with an open adoption. Myths such as "open adoption is co-parenting" or "open adoption is only beneficial to the birth family." 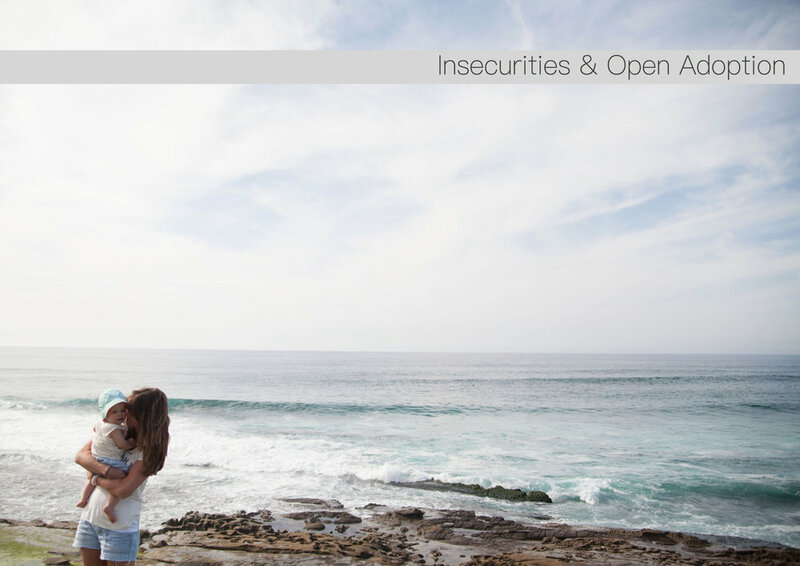 Today I will be discussing how our insecurities can play a role in negatively shaping the way we view an open adoption. Early on in the process, I realized these misconceptions surrounding an open adoption not only stemmed from lack of education, but also my own deep rooted insecurities that had been brewing for many years as we struggled with infertility. I thought that if we had an open line of communication with a birth mother it would make me feel like less of a mother and be a blatant reminder of my infertility and empty womb. Perhaps I also believed the lie that an open adoption would somehow undermine my role as a mother. I quickly discovered a connection between my insecurities and the initial fear I had regarding an open adoption. Throughout our struggle with infertility, I allowed my barrenness to define me. Many days I felt broken and the odd one out among my friends. There was a time when I equated "being a woman" with a growing bump and a positive pregnancy test. But when the growing bump never came and hundred of negative pregnancy tests later, my definition of "womanhood" didn't fit. It was a lie. "There has to be more than this," I said to God one night through tears after throwing another negative pregnancy test straight into the trashcan along with what seemed at the time, my hopes and dreams. Over the next year the Lord carefully and lovingly removed the false identity I had unknowingly placed on myself. I was reminded through reading the Word, my personal suffering and talking with other friends that my identity is solely and explicitly found in Christ. For those who are a child of God, nothing from this world can take away the fullness that is found in Jesus Christ-not even an empty womb. I'm grateful I had this "break through" before we started the adoption process, as I continued to carry this truth with me. Even so, reminders of my "old way of thinking" sometimes crept back in. When our home study provider began describing examples of what an open adoption looked like practically bitterness, insecurity and jealously stirred back up again. "I could never do that," I secretly thought to myself. But, as we received education from our adoption consultant, read blog posts, listened to podcasts and heard stories from birth mothers, adoptees and other adoptive families we came to realize the benefits of an open adoption far outweighed any fears we had. We knew an open adoption wouldn't be easy, but it would be worth it. Where and who we find our identity in has a profound effect on the way we interact with others and respond to circumstances. When our identity is found in Christ-we are free to love others and embrace the uncharted waters we may encounter without fear. Because my identity is rooted in Christ, and not on my role as a parent, I can embrace the beautiful reality that the twins have two mothers, with distinct roles, who love them immensely. Their first mama lovingly carried them for 9 months, brought them into this life and chose adoption for them. Their birth mother made me a mother. She gave them life and I have the privilege of raising them. She chose us to be their parents because she felt it was in the best interest of her children. Can you imagine that kind of love? A kind of love and strength that it takes to place the baby who you carried in your tummy for 9 months, the baby who you felt kick, the baby you heard cry for the very first time, the baby who has your nose and your eyes, into the arms of another woman who her child will one day call “mama?” That is a self-sacrificing kind of love; a love I want my children to know. Research indicates that on going communication with birth parents allows adoptees to have a deeper understanding of identity and where they came from, access to important genetic and medical information and a distinct understanding of why adoption was chosen, which can decrease feelings of abandonment and increase feelings of belonging. And so I propose this question: How could we as adoptive parents, knowing this truth, not take the opportunity to have an open adoption with our child's/children's birth mother if that option is laid before us? I’ve spoken with adoptive families who wish they had the opportunity to have an open adoption with their child’s birth family. They would give any thing to be able to answer some of their child’s lingering questions about where they came from. If you were like us, and struggled with the thought of having an open adoption with your child's birth family, I encourage you to take a few moments and examine yours fears, insecurities and concerns. Birth mothers have given adoptive families a piece of their heart, one that they are entrusting them with forever. There is so much love in that decision. Not only do I want my children to hear about her unconditional love from us , I want them to know her personally. In our mind, the more love the better. When my husband and I first entered the adoption process we were holding pretty tight to a few misconceptions about open adoption. Our perception was highly influenced by lack of education in the area, the media and a few Lifetime movies if I'm being honest here. Initially, the thought of having an open adoption with a birth mother evoked some fear in us. As an adoption consultant and having walked through the adoption process before, I'm embarrassed over a few of the thoughts and concerns I had about an open adoption. I know many others have struggled at times with these thoughts and concerns. And so, I want to spend the next few minutes addressing, explaining and debunking some of the most common myths of an open adoption. Myth #1 : If the birth mother has our information she could change her mind, show up at our door step and try to parent. Out of all of the misconceptions I hear, this one comes to the surface most frequently. Initially, this was one of our biggest fears. But, as we learned more about the intricacies of adoption we discovered this couldn't be further from the truth. After the baby is born consents are signed. Then, finalization occurs after a certain length of time (varies state by state) and a judge declares the child a part of the family forever. The child takes the adoptive family's last name and a new birth certificate is provided. An adoption is final and the decision is irrevocable. Myth #2: An open adoption could potentially confuse the child and cause identity issues. Research indicates that children understand the distinction between their adoptive parents and their birth parents and the specific roles they carry in their life. Adoptees have an understanding of who gave them life and who takes care for them on a daily basis. Decades ago closed adoptions were very common. In many cases (not all) because the adoptee didn't have access to their birth family they began trying to fill in the missing pieces and created fantasies (positive and/or negative) about them. Having an open adoption with the birth family eliminates the mystery and gives the adoptee a clear and realistic picture of who their birth family is and the reasons that lead to them choosing adoption. In the long run having access to their birth family has shown to strengthen the adoptee's sense of identity. Myth #3: Open adoption is too similar to co-parenting. Generally birth parents and adoptive parents understand their rights and responsibilities in the relationship. In co-parenting both parties have some form of custody. In adoption custody isn't shared. Many adoptive families describe their relationship with the adoptee's birth family similar to an extended family-like relationship or an extension of their immediate family. Myth # 4: If the child has on going communication with their birth parents they will eventually end up leaving the adoptive parents when they are old enough. For adoptees, home is with their adoptive family. As previously mentioned, adoptees have a clear and distinct understanding of what role their birth family plays in their life. They were raised and daily cared for by their adoptive family and that’s where they usually live until they’re ready to move out. Many adoptees (not all) are often curious in discovering more about their birth family and where they came from, but this does not change or lessen the love they have for their adoptive family. If you are interested in learning more about this topic I encourage you to watch an informative documentary called, "Closure." Myth #5: Open adoption is only beneficial to the birth family. Research indicates that an open adoption is beneficial to all three parties of the adoption triad (adoptee, birth family and adoptive family). Another study that was published in 2009 by the Journal of Psychology discovered that an "open adoption significantly improved satisfaction in adoptive parents and birth families." For the birth family, feelings of loss and grief may continue throughout their life. However, an open adoption can help them navigate through the grieving process in a healthier way as it provides the birth family with peace of mind in knowing they made the right decision. On going communication with birth parents allows adoptees to have a deeper understanding of identity and where they came from, access to important genetic and medical information and a distinct understanding of why adoption was chosen, which can decrease feelings of abandonment and increase feelings of belonging. To learn more about an open adoption from the adoptee's perspective click here. An open adoption allows adoptive parents to establish a healthy relationship with their child's birth family, gain a better understanding of their child's history and have access to the birth family who can answer questions that may arise throughout their child's life. As an adoption consultant, I get asked frequently to define what an open adoption looks like. However, that can be difficult to do because there really isn't a black and white, one-size-fits-all scenario. I've seen open adoptions where the adoptive family exchange pictures and updates through email and talk on the phone every few months or so. I've also seen open adoptions where the adoptive family keep in touch through talking on the phone and/or video chats and will visit their child's birth family once or twice a year. We wouldn't expectant all mother-daughter or sister-aunt relationships to look identical across the board and the same goes for the relationships that exist between the adoption triad. Although there are many benefits to an open adoption, just like any other relationship it won't always be easy and it will take work and time to grow. Clear boundaries, communication and honesty are extremely important, as well as extending patience, understanding and grace! But, my husband and I have found, along with many others, that the benefits of an open adoption far outweigh any concerns or fears we initially had. I've spoken with adoptive families who wish they had the opportunity to have an open adoption with their child's birth family. They would give any thing to be able to answer some of their child's lingering questions about where they came from. I pray that if you have the opportunity to have an open adoption with your child's birth family that you don’t take this privilege lightly. It's a gift. My husband and I had recently started our home study and I was feeling a bit disconnected from the adoption process. I was very excited about the journey we were on, but there were times when it felt more like an idea than a reality to me. When you're pregnant there are constant reminders that your baby is on the way: positive pregnancy test, morning sickness, weird cravings, belly bump, movement from the little one growing inside your belly, sonogram, etc. I was sharing this struggle with my friend and I will never forget the advice she gave me. "Kelly, I think there are many ways you can be more connected during the adoption process. Have you ever thought about starting a prayer journal where you pray specifically for the expectant mother and her baby?” 1. Journaling. We had been praying about our journey and for our child's expectant mother for quite awhile, but there is something special about putting pen to paper. And so, I started journaling about our process. I started writing down my specific prayers for the expectant mother and her little one. Even though we hadn’t been matched at the time, God knew who she was. I prayed that God would give her strength and that she would feel His peace. There were days I remembering praying specifically that if she was having a difficult day that God would remind her of His love in a tangible way-a way she could actually see and recognize. I wrote specifically to our baby (little did we know we were praying for twins)! I wrote about how much we loved them and how we couldn’t wait to meet them. I prayed they would always be confident of their birth mama’s love for them. I prayed they would never question it. I prayed for their salvation, that they would come to know Christ as their Lord and Savior. It was such a special way for us to feel more connected to them even before we ever laid eyes on them. They were growing in their birth mama’s belly for 9 months, but love had been growing in our heart just the same. 2. Read books and blogs about adoption and parenting. Reading about the adoption process and hearing other families stories ignited hope in us and we were reminded of the faithfulness of our heavenly Father. We also checked in often with our adoption consultant at Christian Adoption Consultant for educational adoption resources. -Adopted For Life by Russell Moore -Christian Adoption Consultants Blog -Loving the Little Years-Rachel Jankovic 3. Prepared the nursery. Preparing the nursery may not be beneficial for everyone, but my husband and I found it very helpful in our journey. It was good to have something tangible to be working on while we were waiting. It also provided us with a sense of hope when we walked into their room. I can’t tell you how many hours I spent in the twin’s nursery before we even knew about them. I would sit in the recliner and journal or turn praise worship music on, as I prayed for them and their birth mama. 4. Friends & family threw us a baby shower. I will never forget the feeling I had walking into our baby shower. As I looked around at the beautiful room filled with all of the women at our church who had been praying for us, I saw my friend standing right in front of me. I fell into her arms with tears streaming down my face, as I was overcome with their thoughtfulness and the hope that this day brought. We spent time in prayer for my husband and I, the twins and their brave birth mama. At the shower we were given the “The Jesus Storybook Bible” with all of the names of the ladies who were at the shower. They also wrote specific prayers for our children on note cards that I saved and placed in a memory box that I will give to our twins one day. 5. Talked with friends and family about our adoption process. Support and prayers from our family and friends as we were walking through the adoption process was invaluable. There were certain aspects of the process that we weren’t able to share due to confidentiality, but we always kept our friends and family updated on where we were at in the process so they could be praying for us. Prayers from our family and friends carried us through the home study, waiting for an expectant mother to choose us, more waiting, meeting our babies and their birth mom for the first time, and all of the emotions and thoughts that come with the adoption process and being new parents. I will never forget the thoughts and emotions that swept over me as I laid eyes on our sweeties for the very first time. All the love that had been growing in our hearts for years overtook me as streams of joy-filled tears ran down my face onto the cheeks of the most beautiful brown eyes staring back at me. They had our hearts wrapped around their little fingers from the moment we held them in our arms. Our words are powerful. Poet, Pearl Strachan Hurd said, “Handle them carefully, for words have more power than atom bombs.” They have the ability to speak life or destroy it. “The tongue has the power of life and death” (Proverbs 18:21). They have the ability to heal relationships or break them. “The tongue has no bones, but is strong enough to break a heart. So be careful with your words” (Unknown Author). Implementing positive adoption language is such an integral part of navigating the adoption process. I stress the importance of being mindful of our language to my families because it is so valuable to learn early on in their journey. How we speak of and to an expectant mother (before birth/adoption) or birth mother (after birth/adoption) can have positive or negative implications. How we speak of and about adoption can bring life or create dissonance. Below I examine a few terms to avoid and examples of positive adoption language to implement. The term “give up” and “put up” should be avoided because it implies that a birth mother gave up on her child. Also, when we discuss “giving up” something it’s typically attached to a negative connotation; “I gave up smoking” or “I gave up eating junk food.” What do these things have in common? They are bad for you. Using this negative terminology can send a message that the child was unwanted. Choosing adoption for your child is not giving up. It’s quite the opposite. Placing a child for adoption is a selfless act of unconditional love. It’s a life GIVING type of love. I’ve heard many couples say, “We can’t have our own children.” And while I know what they mean, it’s important to be mindful of our choice of words here, as it speaks volumes to the world about how you view adoption. This explanation is faulty in many ways, namely because it implies that a child who was adopted isn’t really a part of the family or isn’t as loved as a biological child is or would be. One of the most hurtful comments ever said to me was from a stranger, “Are you going to have any children of your own?” Perplexed, I looked down at my beautiful children and back up at the older gentleman. I could only muster up five words: “Yes, these are my children.” I regretted not taking a few minutes to explain why his choice of words was hurtful. But exhaustion prevented my lips from expressing what my heart wanted to say. Our children are our children. They are not any “less” our children because they didn’t grow in stomach for 9 months. They’re not any “less” our children because they don’t have our DNA. They are our children. Period. DNA doesn’t make a family. Love does. The term, “keep her child,” implies that the child is a possession or an object and gravely fails to consider the responsibilities that are involved in choosing to parent. It also undermines the difficulty that the mother faced while coming to terms with her decision. Using the term, “chose to parent” is a much more accurate, helpful and respectful description of the woman’s decision. Using the terms, “real/natural parents” imply that adoptive relationships are artificial, temporary and somehow “less than par.” It diminishes and ignores the role of the parents. Using positive adoption language (expectant parents/birth parents) is a way to honor the parents and the birth family, as it demonstrates the important role that both play in the child’s life. The child was adopted (past tense). Continuing to use the phrase “is adopted” or “adopted child” is unhelpful, as it can create feelings of distance between the child and his/her parents. When our twins’ adoption was finalized they not only took on our last name, but a judge told us what we knew all along: they are our son and daughter as if they were born to us. Yes, our words matter. Without intending to, sometimes the language we use in adoption can evoke negative feelings. Even though ill intent was never planned, words are powerful and have lasting effect. Choose your words wisely. Choose words that extend honor and respect towards all parties of the adoption triad (adoptee, birth family, adoptive family). How will we afford the cost associated with adoption? What if the expectant mother decides to parent? What if there is a history of mental health issues? What if the expectant mother used drugs or alcohol during pregnancy? Are we too old to be considered? Do we have too many children to be desirable to an expectant mother? As an adoption consultant these questions, concerns and fears enter the conversation quite frequently. But, I can relate. When my husband and I started our adoption journey we had similar concerns. Below, I will examine a few of the most common questions I receive as a consultant. 1. How will we afford the cost associated with adoption? Adoption can be expensive. The cost associated with adoption was one our biggest concerns before walking into the process. If this is one of your fears you are not alone. I would say it’s one of the most common questions I get asked about when a family is inquiring about adoption, “How will we afford it?” And yet, time and time again I see families blown away by the faithfulness of God through the generosity of friends, family and even complete strangers. At Christian Adoption Consultants, we also provide our families with resources and tools on how to fund their adoption through grants, loans, and fundraising. 2. What if the expectant mother changes her mind? Although Christian Adoption Consultants has a lower adoption failure rate (< 20%) than the nation wide failure rate (50-60%), there will always be some level of risk in the adoption process. When a woman is considering an adoption plan for her child, she is making one of the most difficult decisions of her life. Placing a child for adoption is a sacrificial and selfless act of unconditional love. Unless you've walked through this yourself, than you can't possibly understand the thoughts and feelings that surround this decision. No one can predict whether or not an expectant mother will change her mind. However, if you are living and breathing on this earth, then risk is inevitable. You can’t be immune to it; it’s a part of life. A gynecologist can’t guarantee a full-term pregnancy, as there is 1 in 4 chances that a woman will miscarry. But that risk doesn’t prevent couples from trying. There are many potential side effects of prescription drugs and medicine, and yet the majority rarely think twice about taking a pill. At CAC we walk with our families and assist them in navigating the warnings signs to reduce the levels of risks associated with the adoption process. 3. What if there is a history of mental health issues or the expectant mother used drugs or alcohol during pregnancy? I often hear couples say, “We just want a healthy baby.” Drug and alcohol exposure during pregnancy and a history of mental health issues are not uncommon in adoption. The desire for a healthy child isn’t abnormal, but in reality this is something that can’t be guaranteed, even in what some would consider the “best case scenario.” My mother took care of herself, ate healthy and exercised, but in between my older sister and I had 3 miscarriages. When she finally gave birth to me I was diagnosed with cancer and given less than 10% chance of living. I know women who had healthy babies at birth that later developed physical, mental health and/or learning issues. If you are considering adoption, please know that I don’t share this information with you to evoke fear. Rather, I share this to remind you that risk is a part of life and adoption is no exception. I'm confident that God equips families with His grace and strength to handle whatever circumstances may come their way, as I have seen this to be true in my own life. 4. Will we ever get chosen? Many couples express concerns about whether or not their family will be desirable to an expectant mother. “Are we too old? Are we too young? Do we have too many children?” Every expectant mother has their own set of preferences for an adoptive family. Perhaps one expectant mother may desire a family with many children for her little one to play with. Another expectant mother may prefer a family who has a history of infertility because she feels as though she is giving them something they cannot give themselves. Regardless of your situation, God is using everything about your family to connect with an expectant mother, even when you can’t quite see what He is up to. When my husband and I were functioning and making decisions through a “what I can handle” lens, fear quickly became a familiar visitor. However, our worry began dissipating when we stopped thinking with an autonomous mentality and started reminding ourselves that our source of strength does not begin or end with ourselves. It is God who equips us with all that we need to journey through this life (and the adoption process)! It also brought us great comfort to know that we couldn’t mess up or miss out on the story God was writing for our family. If we had let fear govern our decision-making, we probably never would have started the adoption process. And then we would have missed out on the two biggest blessings of our life: Roman and Ruby. Fears and concerns may arise and when they do my prayer is that you would remember the Author who is writing your story-the One who will equip with you everything you need to accomplish everything He will bring along your path. Roman charges at me from across the room and jumps into my lap, bear-hugging me with his arms gripped tightly around my neck, almost knocking me over, all while giggling hysterically. Ruby hears a good beat and instantly begins busting some moves as if she knows the song like the back of her hand, all while belly laughing so hard that she can’t help herself from falling over. She then gets back up again and does the same thing again and again. As I sit back and look at our beautiful children, my heart beams with pride and gratefulness. They are bright little lights to this world, so full of joy. They've filled our hearts and home to the brim. I love being their mama. But in these heightened moments of joy and laughter, I can’t help but think of their birth mama and the brave decision she made in choosing adoption for her children. However, it wasn’t just a brave decision; it was the most difficult and heart wrenching decision of her life. 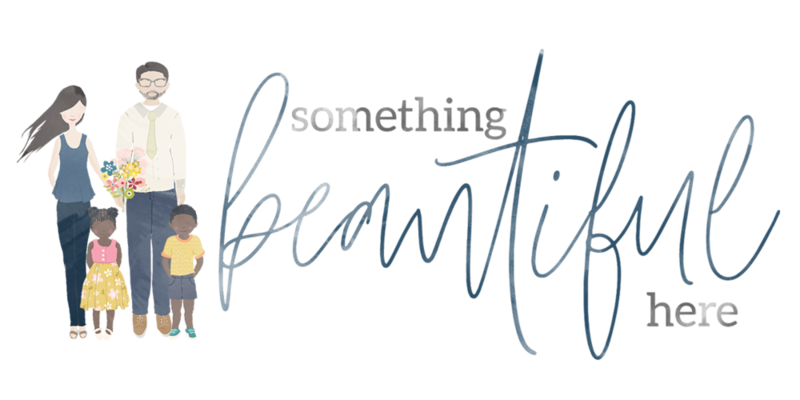 Although I completely understand why people use the word “beautiful” to describe adoption, it's also a deeply complex and difficult process and can’t be summarized in one word or phrase. There are juxtapositions and tensions in adoption that I sometimes find difficult to absorb. There are three legs to the adoption triad: the adoptee, the birthmother, and the adoptive parents. For the most part, society is only privy to one side of adoption: the parents who have adopted a child. And this is understandable. After all, it's the relationship our friends and family witness for themselves. In a perfect world, adoption wouldn’t exist. However, the reality is that we don’t live in a perfect world. We live on the other side of the Fall, where brokenness, pain and death reside. Although beauty can be found in the brokenness of life, it doesn’t erase all of the pain or hurt that one encountered to get there. Regardless of how beautiful adoption can be, there is loss and brokenness within it. When a woman chooses adoption for her child, she is making the most difficult decision of her life. Placing a child for adoption is a sacrificial and selfless act of unconditional love. As the baby grows inside of her womb, the birth mama feels the baby kick and respond to her voice, and she visually sees the child growing inside of her. Can you imagine the emotions she feels as she places her baby into the arms of another woman who her child will one day call “mama?" I can’t imagine that type of loss. Imagine for a moment leaving the hospital without the child that you grew in your belly for 9 months. As you walk through the door to your home, the quietness overwhelms you. Someone is missing. There is no baby there to wake you up in the middle of the night, there is no baby to feed or sing lullabies to, there is no baby to swaddle and snuggle, and there are no more late night talks to the little one that was growing inside of your belly. Your baby is being cared for by another woman. And you chose this mother and father to be the parents of your child. But, even if you've found peace in your decision and are confident that you made the right one, that doesn’t negate all of the pain and feelings of emptiness associated with the loss. Imagine answering questions from curious co-workers and friends about the baby, and having constant reminders like stretch marks or possible scars from the c-section you painfully endured. However, the stretch marks and scars on your body pale in comparison to the scars on your heart. I can’t imagine that type of loss. Sometimes I am reminded of this loss as I’m rocking the twins to sleep. Roman will look up at me with those beautiful big brown eyes and I can’t help but think of his birth mom. In that moment, I'm overwhelmed by the full weight of the juxtapositions surrounding adoption. Her greatest loss made me a mama. My arms are full while her arms are empty. My house is filled with the sight and sounds of toddlers running around, babbling, throwing toys everywhere and giggling uncontrollable, while her house is quiet. Thinking about all of the “firsts” she will never experience first hand brings the most complex feelings and emotions to the surface. Even now, I find it difficult to articulate these thoughts. Adoption is more than a brave decision. Adoption is one of the most selfless, sacrificial acts of unconditional love that any human being can do for another, one that entails great loss. The grieving process for birth moms is complex, ongoing and a lifelong process to work through. These women deserve our utmost love, prayers and respect. They have given us a piece of their heart, one that they are entrusting us with forever. All rights reserved, no part of this website can be used without written permission from the author. All content and images are property of Something Beautiful Here and may not be used without permission.